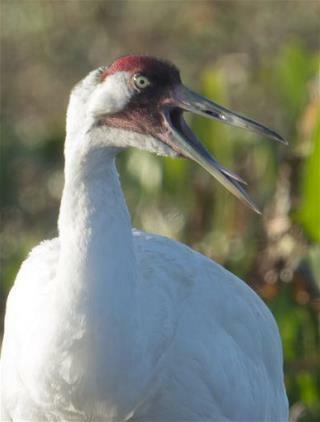 (Newser) – The endangered whooping crane population currently stands at only about 600 in all of North America—and shootings are cutting into that number. In the past few months, three of the continent's tallest birds, at some five feet, have been killed: Two were apparently killed in November in Kentucky, and one was found shot dead in southwestern Louisiana on Friday. The identities of the birds make a "senseless act" all the more "devastating," says Robert Love of the Louisiana Department of Wildlife and Fisheries. The Kentucky pair were lifelong mates believed to be shot together but discovered five miles apart, the Los Angeles Times reports. They may have been mistaken for sandhill cranes, legal to shoot at certain times of year in the state. It doen't matter how may endangered creatures there are, assholes will always destory them. I was setting next to a 30 year (actually 12 year POS Mentally) yesterday who threw rocks at little beetle which was walking across a dirt road. If he wasn't 100 lbs bigger than me, and there were no witneses, well, just no witnesses, one of us would have not left there. These kind of people grow up to abuse or kill normal humans, and become Democrats. if you are a hunter you should eat what you shoot! Louisiana and KY? Those silly southern rednecks... why is this a surprise?